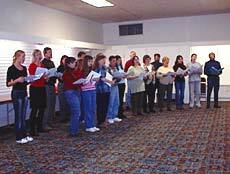 [NOV. 7, 2002] The turnout exceeded everyone’s expectations. In spite of gray skies and a cold drizzle, Sunday Tea at the Lincoln T, an event organized by an informal group of downtown Lincoln merchants, brought crowds to the square to browse through the stores, eat pastries and other munchies, listen to music, visit and just simply enjoy themselves. "This is the best thing that’s happened downtown for a long time," said Connie Dehner, who was part of the crowd elbowing its way through the local shops. "It’s wonderful to see all these people downtown. They’re having a great time." Even though her store was "just packed all day long," Melody Shew of MKS Jewelers also noticed that people were enjoying themselves. "Everybody was in such a good mood and having a good time," she said. Others thought it was like old times in downtown Lincoln. "We haven’t seen it like this for a good many years," said Tom O’Donohue, owner of General Consulting Services. "This is really amazing for a dreary November afternoon." Music by four local groups was an additional inducement to leave a cozy living room and come downtown. The temporarily empty Gresheim building on the corner of Kickapoo and Broadway was an ideal place to schedule the entertainment, and several people commented on its unexpectedly good acoustics. During the afternoon, the Possum Holler Pickers played old-time tunes, the Community Chime Choir performed show tunes, the Second Baptist Church Choir rocked the room with gospel music, and the Methodist Church Madrigal Singers wove traditional music into intricate patterns. Shoppers were quick to say they were enjoying themselves. 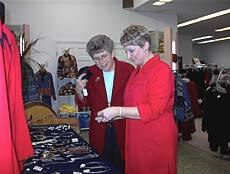 Browsing at MKS Jewelers, Barbara Dahm, Jan Ulrich and Betty Tiffany thought the Sunday event was a wonderful idea. "We are Christmas shopping with a difference," Dahm said. "We’re getting ideas for presents our children can give us. This is the nicest thing they’ve done downtown for a long time." Not just Lincoln folks, but people from other communities were impressed. Joyce Dings from Havana is planning to come back and take home some Christmas gifts she spotted Sunday. "I haven’t been here for a while, and I couldn’t believe how many craft shops there are downtown," she said. Suzanne Kubat of Lincoln thought it was a wonderful opportunity to bring in out-of-town visitors. Even though she’s from Lincoln, she commented, "I didn’t know the number of treasures that were hidden here." Margaret Peifer, buying a piece of jewelry at That Place/Merle Norman, may have summed it up when she said, "I’ve never seen so many people strolling around and having a good time. It’s like a little community celebration." Store owners were amazed at the number of people in their shops. Some tried to count the customers but soon got so busy they lost track. 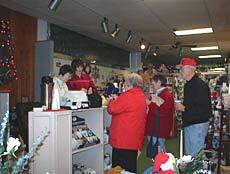 Treasure Chest proprietor Barb Reinwald had never before had people standing in line at the cash register. "I lost count at 75, and that was a half hour ago," she said at about 2:30. Julie Tarter, owner of That Place/Merle Norman, said she started trying to count the crowd on her computer but lost track at 90, not long after 2 o’clock. "We had people in all day, from the moment we got here," said Jeanie Xamis of Serendipity. "Many were new people, not my regular customers." Husband Nick, her Sunday help, said he’d brought a book to read if things were slow, but he never got a chance to open it. "I don’t remember the last time it was hard to find a place to park downtown," said Angela Getchel, who was taking the day off from her job at MKS. Getchel and 6-year-old daughter Ashley were gift shopping, and she said she appreciated the chance to see what other merchants had to offer. People were not just shopping, they were also taking the opportunity to sit down at Cookie’s Bakery, eat a bite and visit with friends. Marcia Phillips, who works at Sports Plus, was one of them. She was enjoying a quiet moment eating white chili soup and visiting with friend Becky Malerich. "Even though I work downtown, I don’t get an opportunity to see everything that’s for sale. I think this is wonderful, seeing all these people in spite of the nasty weather. If the weather had been nice, we wouldn’t even be able to walk around down here." When four o’clock came and the crowds had gone home, a group of merchants got together at Cookie’s. Their feet might have been hurting from standing all afternoon, but their spirits were high. Everyone agreed that the day had far exceeded expectations. "We asked ourselves, ‘What would it take to make us feel the event was a success?’ Our answer was 100 people," Cookie Wentworth said. At 2:30 that afternoon, by actual count, there were well over 100 people just in the Gresheim building, listening to the Second Baptist Church Choir rock the rafters, and still customers were crowding the shops, some of them standing in line to be waited on. How did it all start? No one merchant wanted to take the credit. A group who like to meet for lunch at Cookie’s began asking themselves how to bring more people downtown. They were concerned that many new businesses closed within just a few years. They didn’t think people really knew what was available in downtown Lincoln. "People say, ‘There’s nothing downtown anymore.’ I ask, ‘How long since you’ve been here?’" Wentworth said. 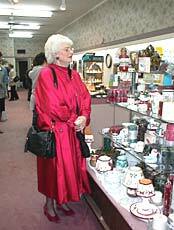 "We know we’ve got some wonderful shops here and wonderful people that love to show their products and visit with people. We didn’t do this just to get sales, we did it to show people what there is in downtown Lincoln." While working out a map of the retail and service establishments people could visit, Sam Redding of Prairie Years saw that the stores on Broadway and Kickapoo Streets formed a T, so the name became "Sunday Tea at the Lincoln T."
The success of Tea at the T has the merchants already talking about doing it again. They are meeting this week to evaluate Sunday’s event and plan for the next one. No date has been set yet, but they are not going to wait a year to do it again, Wentworth said. Those who participated include Serendipity, Three Roses, Sugar Creek Essentials, Beans & Such, Treasure Chest, Prairie Years, Action Rental, Becherer’s Jewelry, Sew Many friends, Seventh Heaven, Cherished Memories, Wibben’s Computer, Abe’s, That Place/Merle Norman, Lincoln Music Center, Kathleen’s Hallmark/Lighthouse, Prairie Eye Center, Sports Plus, Pink Shutter, MKS Jewelers, Cookie’s Bakery and Glenn Brunk. State Bank of Lincoln, Union Planters Bank and A.G. Edwards gave donations to help cover expenses. [NOV. 2, 2002] There’s one thing you can do as a computer user that can ruin a good computer faster than just about anything else, and you probably don’t even know that it’s a problem. That one thing is plugging and unplugging certain devices while the computer is on. There are three especially sensitive plugs on your computer system, and you should always turn your system off before unplugging or plugging these. They are the keyboard plug (the little round plug with a ps/2 connector), the mouse plug (same connector, maybe a different color) and the parallel printer cable. If you plug these devices in or unplug them while the computer is “hot” or on, you run the risk of damaging the controlling chip inside, and that usually means lotsa downtime and an expensive repair bill. Turn the computer off first! And just to make sure that the computer is off rather than in power-save mode, unplug the power cable from the back of your system. Plugging the mouse or the keyboard into the wrong port can also cause damage to some systems. So, look before you leap (or in this case plug). Reading the little symbols on the back of your computer can save you some serious bucks. Oh, and one more thing: Those little round ps/2 plugs are rather tender. You should look at the alignment of the plug and the socket before you attempt to plug them in. Holding the plug to the socket and turning it to find the proper orientation usually results in bent pins and the need for a new keyboard or mouse! [For those techies out there who may be reading this article: Serial devices, USB devices, firewire devices and even the old AT-style keyboards can usually be safely plugged and unplugged while the system is hot. However, it is always safer when the system is off, especially in static season. Turn it off, ground yourself out and then plug it in]. For Sale: Beautiful 2001 Olds Bravada Gold Edition, fully loaded, including OnStar, 4-wheel drive, CD/cassette, heated seats, flawless cranberry exterior finish and beige leather interior. 24,000 mi. $21,500. Ph. 947-2436 after 5:30 p.m. or anytime weekends.